Ida's two sons were brutally murdered. Justice was never found. Ida felt like she didn't have the strength to carry on and she couldn't hope anymore. But encouraged by her daughter, Ida put on her first pair of running shoes at the age of sixty-seven and began to chase the paralyzing sorrow from her heart. Running gave light and new energy to Ida, and since her first race nearly thirty-five years ago, she's kept running and never looked back. Holding the world record for the fastest time in the 60-meter dash for the 95-99 age group, Ida isn't slowing down. Now she gives us a clear picture of what it means to overcome obstacles. Ida Keeling shares her inspirational story about growing up as a child of immigrants during the Depression and later raising four children as a single mother. She offers time-tested truths gathered from a lifetime of watching a nation change and from a life-long faith in Jesus. "Every night, I thank him for my many blessings, for his guidance, for his protection," Ida says, "And every night he tells me, 'Miss Ida, you just keep on, because I ain't done with you yet." 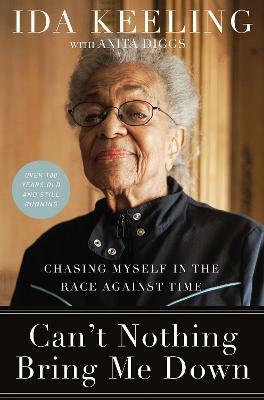 102-year-old Ida Potter Keeling is a mother, activist, and runner. Miss Ida, as she is known in her Bronx community, grew up the child of immigrants during the Depression. She began working to help provide for her family at age 12. After her husband passed, she raised her four children alone in a single bedroom apartment while serving as an active member in the Civil Rights movement. She started running at 67 years old to chase away the grief following the murders of her two sons. Today, Ida is a world record-holder for the 60-meter dash in the 95-99 age group, the 100-meter dash for the 100-104 age group, and continues to set new records with each race. Anita Diggs is the author of seven fiction and nonfiction books. As an editor and senior editor at Time Warner Publishing, Thunder's Mouth Press, and Random House, she acquired and edited both fiction and memoir. She holds a BA from the State University of New York/Empire State College and an MFA in Creative Writing and Memoir from Hunter College.